Quotas for the Lower and Upper Klamath River for Chinook salmon has been met according to CDFW. The Lower Klamath from Weitchpec down to the mouth met their adult Chinook salmon quota of 555 adult Chinook salmon several weeks ago and are only allowed to keep Chinook salmon under 22 inches. The upper Klamath from Weitchpec Bridge (Hiwy 96) to 3,500ft below the Iron Gate Dam was expected to meet their quota of 183 adult salmon Wednesday Oct 5th and can only keep Chinook salmon under 22in. The quotas for the Lower Trinity from the confluence of the Klamath to Hawkins Bar Bridge and the Upper Trinity from Cedar Flat Bridge Hiwy 299 is 183 each side has not met their quota as of this reading. You are allowed to keep 1 adult over 22in and 1 jack under 22in until the quota is met which is expected sometime mid-October. October 1st of 2016 starts the new water year for 2016/2017 and it appears that we are in for a good start. We have already received 1.1in of rain at my house hear in Willow Creek with more to come within the next week. Even though we are expecting several inches of rain from the ensuing storm the Bureau of Reclamation will be reducing the releases from Lewiston Dam down to the summer flows of 300cfs. Hopefully the storm will compensate for the reduction of water releases and the Upper Trinity and one can still drift that section of the river in a boat or raft. It usually takes 3 inches of rain for the river to see an influx of water from the incoming streams. I have noticed that many of the inflowing streams that feed the trinity are really low at the mouths. Some are so dry at the river that sometimes there are only wet rocks or wet sand at the mouths. Trinity River Hatchery: Sept 24 thru Sept 30, Spring Chinook salmon, jacks 74, adults 411, total 485, season total 1,675; Coho 0; Steelhead, adults 3, season total 11. Junction City Weir: The Junction City Weir has closed for the seasonal spring run and the totals are: Chinook salmon, jacks 49, adults 105, season total 154; Coho salmon 0; Steelhead, ½-pounders 7, adults 60, season total 67; Brown trout, under 16in 1, over 16in 9, season total 10. Willow Creek Weir: Sep 24 thru Sep 30 ; Chinook adults 95, jacks 23, total 118, season total 421; Coho 1; Steelhead, ½-pounders 5, adults 92, total 97, season total 483. Fishing: Fishing has been slow but the rewards have been great for those who are willing to fish hard and work at it. Although we are coming close to reaching quota for the take of adult Chinook salmon the quality of salmon coming through the W.C. weir is great. There are fewer salmon but many are bright and BIG! Some reaching 30lbs. It is even better news for the steelhead fishers as there have many large adults coming through the weir, both native and hatchery. 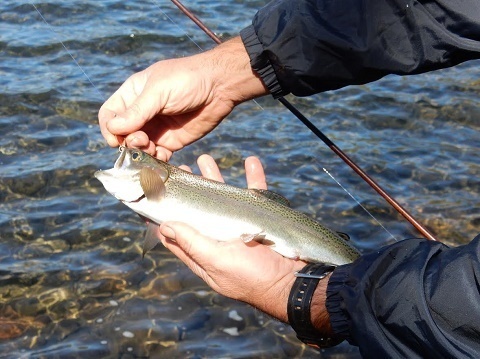 This is great news for the fly fishers as they are going to have a chance of landing the steelhead catch of their lives. It will be hard fishing for them as the river is low and clear but the trick will be to get your fly down to them as they will be holding below the riffles in the deeper holes and under the swift water. Last week Todd LeBouf of Tiger T Guide service (530-356-6032) fished the canyon area of the Upper trinity and was able to only get a couple of hits on salmon (maybe they hadn’t reached that area of the river yet) but one of his fishing buddies fished the Steelbridge section of the river and was able to hook 2 nice salmon and one nice steelhead on flies. Another one of his fishing buddies fished the Junction City to Lime Point using plugs and hooked into 6 salmon and 3 steelies. Nice fishing if I do say so! No word from Del Loma this week but I would expect that they were doing good form the count at the weir. Mid-Klamath: Iron Gate has upped the water flows again to 1,060cfs and the Shasta River and the Scott River counts have started. The Shasta River, Bogus Creek and Scott River are up and running. 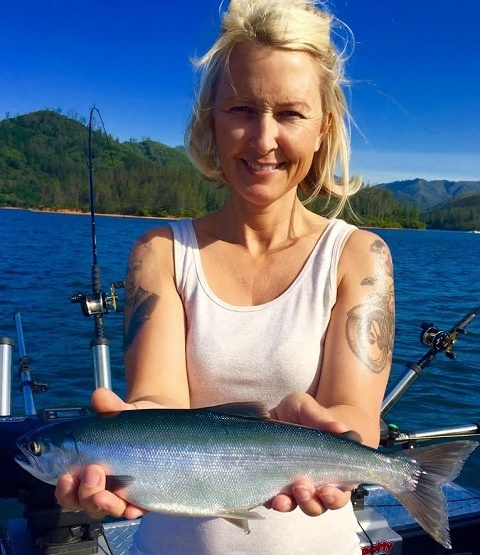 The Bogus Creek counting station started Sep 8th, the Scott River station started Sep 22nd and counted 6 adult fall Chinook; 2,176 fall Chinook salmon have been counted at the Shasta station and 80 fall Chinook salmon at the Bogus Creek station. This is good news even though the Klamath River of fall adult Chinook salmon quota has been reached they are still receiving adult salmon to reach the egg quota needed to keep the hatchery at full production to help for future salmon returns. Down lower on the Mid-Klamath salmon fishing has started to pick up some as the river water cools down. Hopkins and Bluff Creeks are still being used a quick cool down for the returning salmon and Orleans to Weitchpec section has been doing well for fly fishers according to Kenny Peugh. Lake Conditions: Whiskeytown is 95% of capacity with inflows of 719cfs and releasing 644cfs into Clear Creek; Shasta is 60% of capacity (decrease of 2% &7ft), inflows are 1,644cfs and releases are 6,060cfs; Keswick is 889 of capacity with inflows are 6,609cfs and releasing 6,756cfs; Lake Orville is 45% of capacity (a decrease of 1% & minus 4ft), inflow is 1,767cfs and releases are 4,365cfs; Lake Folsom is 30% of capacity (minus 2% & minus 1ft), inflows are 867cfs and releases are 1,228cfs. Trinity Lake: The Lake is 117ft (an increase of 1ft.) below the overflow and 39% of capacity (1% decrease) Inflow to Trinity Lake is 171cfs and the Trinity Dam is releasing 456cfs to Lewiston Lake with 19cfs going to Whiskeytown Lake and on to the Keswick Power Plant with 6,756cfs being released to the Sacramento River. Trinity River Flows and Conditions: Lewiston Dam releases are 427cfs, water temps are 52.3 and air is 86 degrees at 3:00p.m. today. Limekiln Gulch is 4.8ft at 414cfs, water temps are 53.9 and air is 80. Douglas City is 6.2ft at 436cfs, water temps of 54.5 and air is 85.Junction City is 1.6ft at 451cfs. Helena is 8.5ft at 469cfs with water temps of 58.2. Cedar Flat is 2.6ft at 514. Willow Creek is estimated at 582cfs, air is 79 and water at 60. Hoopa is 11.5ft at 649 cfs with water temps of 62.2 Flows at the mouth of the Trinity at the Klamath are estimated to be 2,309cfs. Mid-Klamath: Iron Gate Dam releases are 1,060cfs. Seiad Valley is 2.2ft at 1,200cfs. Happy Camp is estimated at 1,242cfs. Somes Bar is estimated at 1,486cfs. Orleans is 2.4ft. at 1,660cfs. Klamath River at Terwer Creek is 8.1ft at 2,590cfs and water temperatures of 62.9 degrees. Flows at Smith River, Dr. Fine Bridge are 4.9ft at 286cfs. Temperatures in the Valley last week were 77/47 degrees with 1.1 inches of rain with a season total of 1.1in of rain and 0.00in. of snow. Temperatures in the valley next week are expected to be 78/44 degrees, partly cloudy and sunshine in the first part of the week then scattered shower Thursday and rain Friday through Monday.